Um, wow!! These look fantastic. Is there anything much better than cream puff dough? I think not. Jennifer, my crappy piping skills aside, I had a lot of fun with this recipe. I love how everything worked out so that this could be my Valentine’s Day post. My thanks to Jenny Yu and the Universe for making it happen. Jessica, I couldn’t agree more. 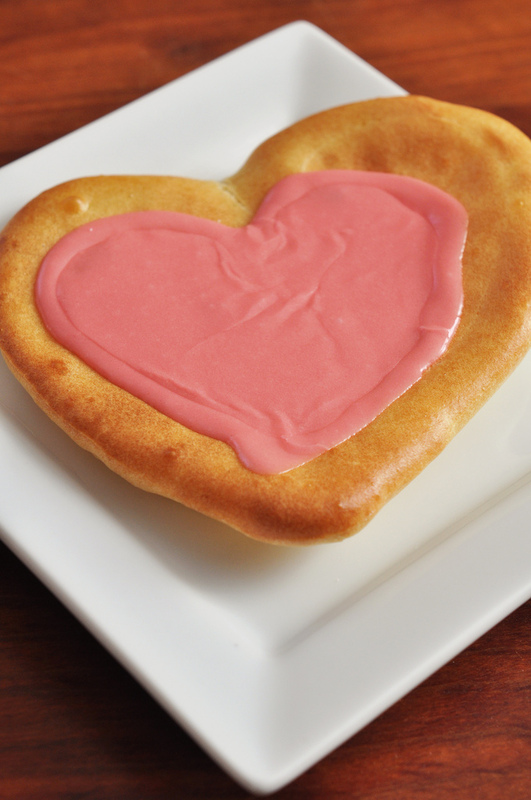 Who knows, you might already have everything you need to whip up some puffy hearts today. If you don’t have a piping bag, fill a large ziptop bag with the dough and then snip off part of one corner. Those are delightful! Can you make some for Saturday??? please!!! Elizabeth, I’m making 6 hours chili for Saturday. Besides, I would be completely intimidated to bring these to that gathering. But maybe I’ll talk myself into it between now and then. Cream puff dough? Yes, please!! Jenna, embrace the puffy hearts. They will treat you right. I’ve discovered that a lot of the favorites that my mom/grandmother/someone special made for me as a kid are actually pretty easy to make, ingredients or preparation-wise. But when you’re a child, you’d swear they were made with magic. I love everything about these puffy hearts: the simple ingredients, the cute pink frosting, the photos and the memory that goes with them. Ali, you are spot about the magical nature of our fondest food memories. What I like best about these is that they’re like a handmade valentine. Sure you could get a prettier one at the store but this was clearly made with love. Love this tradition and seeing as I have prepared very little for my kids for this Valentine’s Day, I may just try and fit the in my schedule. Kristen, thanks for letting me share this over at Love Feast Table. You could totally pull these off this afternoon. Let me know how it goes. These are starred. I wonder if Mrs. Rev would want to take a stab at these together? Brooke, I would love to see what you and Mrs. Rev could do with these babies. Actually, I already see her comment up there so I might be in luck! URB was also one of the first food blogs that i followed & have mercy if i didn’t pester her with questions at first! these look so delightful, absolutely perfect for Lurve Day! Lan, Jenny was very gracious in person. How about you and I make a date to get together and bake up a batch of these? Happy ❤ to you Lan. My mom used to make cream puffs. I loved them. And when they’re heart-shaped, I imagine they are better! Kitch, I think these are absolutely magical.